How Can India Realize It’s Potential As A Tourism Hotspot? This Indian airport is an engineering masterpiece. 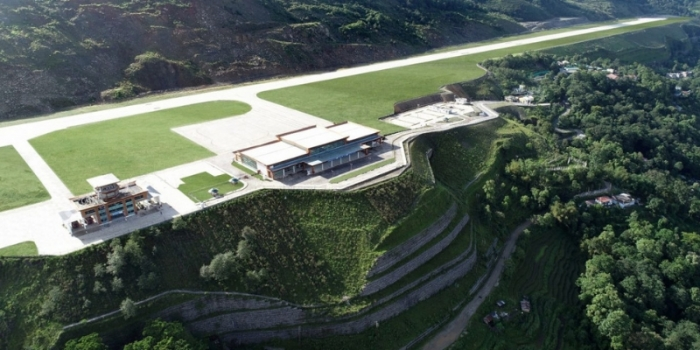 Pakyong Airport in Sikkim is carved out of the Himalayan mountain side. Engineers had to brave seismic terrain and monsoon rains. And haul heavy materials up narrow mountain roads. They also had to build one of the world’s tallest reinforced soil walls to make the site stable enough for 1700-meter runway 1370-meters above sea level. It’s India’s 100th airport-and one of its highest. Sikkim hopes it will bring more tourists to its lakes, mountains and glaciers, enjoying breathtaking view as they land on the soil of Sikkim. India’s aviation industry is growing rapidly. And could become the world’s largest domestic civil aviation market in the next ten-fifteen years. India’s tourism industry is also growing fast. India has done quite a lot in recent years to grow its travel and tourism industry. This is clear from the improvements in 2017 ‘Travel of Tourism Competitiveness Report’, in which India has risen from 65th position in 2013 to 40th in this year’s edition. Today, India is one of the fastest growing aviation markets in the world. But, there is still much more that could be done. In carrying out the research for their new report, “Incredible India 2.0 – India’s $20 Billion Tourism Opportunity”, Bain & Company undertook set out a detailed research to demonstrate the monetary opportunities available if India was to invest in and prioritize it’s aviation, travel and tourism industry. To complement the holistic approach at the national level, India should also have a state-level approach with a proposal to create a pilot project in a state which has traditionally welcomed fewer international visitors, and to develop a few of its destinations via public-private cooperation. The future of both India, and especially it’s travel and tourism industry, is bright if it continues to focus on its opportunities and address its current limitations.